Hooray for the first real cyclocross race of the season! My last cyclocross race was in 2009. 2009! That was 7 years ago! I have much more fitness now than I had then (it helps that I'm not running and swimming anymore), but the 'cross scene here is way more competitive than it was in Kansas. In Kansas, many race directors would completely waive the entry fee for cat 4 women to try to get more of us racing. I think the biggest field I ever raced in was 13. Our cat 4 women's field had 17 racers. I think around half of them were doing their first cross race! The women's masters field went off 30 seconds before us, and there were another 9 in that field. There were another 15 entrants in the 1/2/3 and 3/4 fields that raced a couple of hours later. I'd considered doubling up for the 3/4 race, but it was hot as balls and I was pretty sure I would explode if I stayed out in that heat for another 45 minutes of racing. I got a spot in the second row to start, but took a bad line in the gravel and fell to about 8th wheel. I managed to pass a woman or two in the first quarter of the course. I was sitting about 6th wheel coming into the barriers. Did fine on the dismount and cleared both barriers without eating turf, but I set my bike down with something less than what you might call grace and dropped my chain. Tears. The pit was right after the barriers, so I can in there to get my chain back on. It took all of 10 seconds, but I lost probably 5 or 6 places there. I got back on and started trying to claw my way back. I went deep on the first 2 laps. 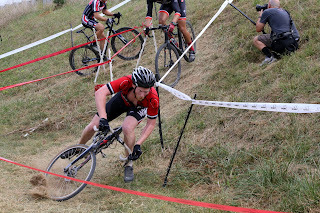 Apparently, there was a crash right in front of me on a steep off-camber--I'd decided while pre-riding the course that I would take it as a run-up, after trying to ride it twice and sliding out both time--where a couple of women tried to ride it and failed. I guess I got off and ran around them, but I don't remember doing it. The only reason I remember the crash at all was because my teammates told me about it after the fact. That's how deep I went on the first 2 laps. I picked up a few positions in that crash, picked off a couple more in the third lap, and passed one more (someone whom I've raced in road--Anna--who has ridden me into the ground plenty of times) at the end of that lap. I wasn't sure where I was in the field, at that point, but I figured top 10. Somewhere in the third lap my psoas started spasming. I've had this happen before in cross races (although I can barely remember that far back) and even while teaching spin classes. It also used to happen sometimes when I was running. I'm not sure what causes it, but the pain is almost incapacitating. I've had to leave spin classes in the middle of of teaching before, it's been so bad. I didn't quit the race in the middle, but I did have to slow down a lot. Anna passed me back, and I could see two more women I'd passed earlier gaining some ground back on me. Standing breaks bought me about 20 seconds of relief, so I stood and coasted on the downhills as much as possible in the last 2 laps. I managed to hang on for the last lap without letting anyone else re-pass me. And that was the race! I ended up finishing 5 out of 17 women. I was also the last rider who did a full 5 laps. I think I might have been able to finish in third if I hadn't dropped my chain. But who knows? It doesn't matter! First cross race of the season is in the bag, and I enjoyed it. I rode myself into the ground and had two beers afterwards. So I've already got a great start on my season goals. Regarding the psoas, I think it's a combination of factors: the course was really bumpy, which puts extra stress on my psoas as it works to help my core stabilize against the movement of the bike on the ground; 'cross bikes have laid-back geometry to help with handling, which puts me into more anterior pelvic tilt and compresses my hip flexors; and I'm hammering super hard on the pedals. I need to resolve the issue so it doesn't hold me back in future races. One of my coworkers who specializes in athletic training (I specialize in functional training and stability for older adults, so my needs are a little outside of my wheelhouse) is helping me come up with a core stabilization routine. I'll also work on my pedaling technique to take some stress off of my hip flexors, and I'll make a point of standing and coasting more in races to vary the stress on my body. I suppose in some courses there will be more natural variation, too, which will reduce my time grinding out in a single position. And if it continues to bother me, I may adjust my bike for a more upright position. 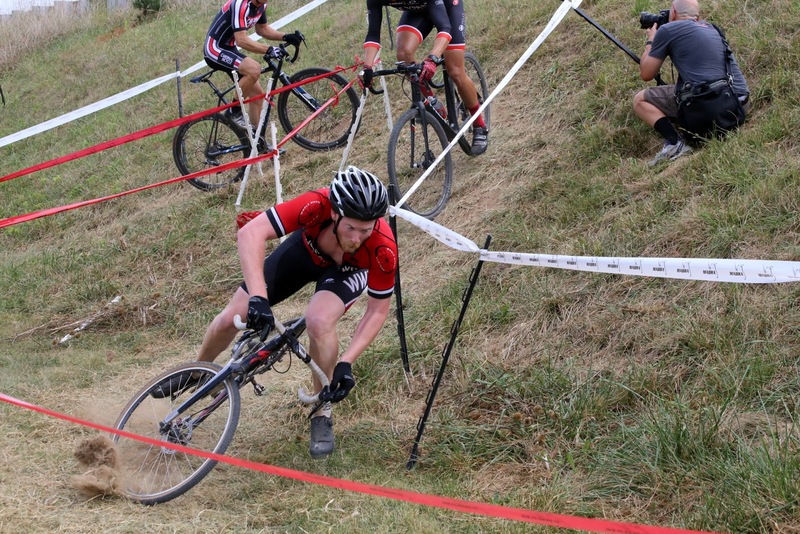 Next race is Hyattsville CX on Oct. 2, which gives me 3 weeks to increase my fitness (and adjust my chain catcher)!